The Leopards baseball team won both games against the No. 13 Cal Lutheran Kingsmen in a Southern California Intercollegiate Athletic Conference doubleheader at Campus West Saturday. The Leopards won game one 9-7 and won game two 6-5 in 12 innings. La Verne came into the doubleheader with a 20-8 overall record and 5-5 conference record. Both games provided plenty of offense and drama as the Leopards made strong comebacks to win both games. Game one started strong for Cal Lutheran as junior designated hitter Ryne Yamashiro and senior catcher Kaden White each provided runs in the first inning to make the score 2-0. The Leopards fired back in the second inning after senior outfielder Christopher Ligot and senior first baseman Ryan Aguilar were able to reach home plate to tie the game. The Leopards took their first lead of the game in the fourth inning after a double by Ligot, followed by a base hit by junior shortstop Jacob Benson helped contribute to the go ahead run. Cal Lutheran’s offense reignited in the sixth inning with Yamashiro, sophomore second baseman Tanner Wright, junior outfielder Ryan Probst and junior infielder Daniel Stauffer contributing five runs to give the Kingsmen a 7-3 lead. The Leopards made every attempt to tie the game in the sixth, but were only able to bring in two runs from junior third baseman Tanner Browning and freshman outfielder Brandon Shiota. Momentum shifted in favor of the Leopards in the seventh inning when senior utility player Christopher Peres came up to bat. He crushed a two-run homer over the center field wall to tie the game. The Leopards regained the lead in the seventh after Benson scored from third on a passed ball by White, Cal Lutheran’s catcher. Cal Lutheran head coach Marty Slimak was ejected after arguing with the umpire over the call. Senior second baseman Ryan Galan added one more run for the Leopards after successfully stealing home. The Leopards won game one 9-7. They carried their momentum into game two with junior catcher Adam Santa Cruz driving in Browning after a single to center field. Santa Cruz had an incredible game two, driving in two runs and getting four hits in six at bats. 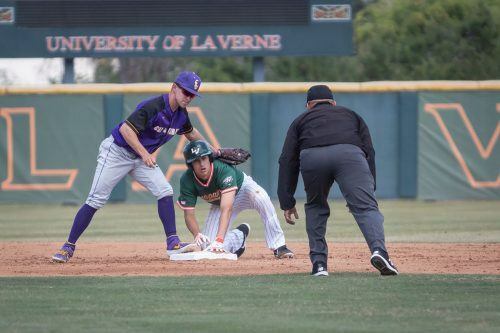 Cal Lutheran scored their first run of game two in the second inning after a wild throw gave freshman outfielder Sean Blandino the chance to reach home plate. Cal Lutheran added three more runs in the second inning to take a 4-1 lead. An RBI single by Browning and an RBI double by Santa Cruz helped the Leopards shrink Cal Lutheran’s lead in the third. Great defense was showcased by both teams over the next few innings, including an incredible diving catch by senior outfielder Brandon Vogel. A Yamashiro single in the seventh inning led to another score for Cal Lutheran and added to their lead. The Leopards quickly loaded the bases with one out in the eighth inning. Aguilar scored after Shiota was hit by a pitch during the bases loaded situation making the score 5-4. Browning followed that up with a sacrifice fly ball which let Benson reach home to tie the game at five runs each. Both teams continued to battle it out in extra innings adding drama with each bat being crucial. Galan took over in the 12th inning, hitting a base hit and stealing second to put him in scoring position. Shiota advanced Galan to third on a ground out to second base. Galan finally was able to steal home and end the game after a sacrifice bunt by Browning. “Right when I saw the pitcher not even look at me and throw to first, I knew it was over,” said Galan about scoring the final run. The Leopards won game two 6-5 and swept the series. Head coach Scott Winterburn credits the series sweep and the come from behind victories to his team’s toughness and grit. Christopher Livingston can be reached at christopher.livingston@laverne.edu.